From The Ocean To The Soup Bowl: The Cold Hard Facts About Shark Fin Soup - We Love Sharks! From The Ocean To The Soup Bowl: The Cold Hard Facts About Shark Fin Soup - We Love Sharks! Since the early 1980s, the shark fin soup industry has grown in leaps and bounds to the detriment of sharks and our oceans whether we choose to believe it or not. Though people still have an unparalleled fear of sharks, the reality now is that the market for shark fins has grown to the extent that is now a multi-billion dollar industry. The apex predator should fear us, humans, more than we should fear them; and that’s putting it lightly. People may ask what all the fuss about shark fin soup is. We eat other kinds of meat so why not shark fins too? Only the rich eat shark fin soup so is it such a big problem? Sharks live in the ocean so how does their death affect me? Let’s see if we can answer some of these questions and more. Shark fin soup is a thick soup or broth that originated from China and it is made with shark fin. The earliest reference to shark fin soup goes as far back as the Song Dynasty in AD 968. This time is generally regarded as the golden age in Chinese history. It was a time of great prosperity, rich culture and culinary delights. As a result, the wealthy were very keen on serving their guests with sumptuous delicacies in the form of unfamiliar dishes. For example, they would serve camel humps and bear paws often wasting the rest of the animal. The first time shark fin soup was served, an emperor had a banquet and in a bid to show how powerful, generous and wealthy he was, he ordered the dish served to all his guests. Since sharks were seen as dangerous to catch and kill, it pleased the emperor to be able to impress his guests with such a rare treat. .. if a groom’s family cannot afford shark fin soup at the wedding party, the bride’s family will conclude that the groom is not worthy to marry their daughter. To date, it remains a delicacy, an integral part of Chinese tradition and a ritual symbol of wealth and luxury for display at important events. For this reason, it is commonly seen on the menu especially at weddings and banquets. In fact, it is commonly said that if a groom’s family cannot afford shark fin soup at the wedding party, the bride’s family will conclude that the groom is not worthy to marry their daughter. The soup is very popular in Vietnam and Japan too. In other words, it is a status symbol, and a gesture of generosity from the host to family and friends. The Steps For Making Shark Fin Soup. Shark Finning: Extracting The Main Ingredient. The most common method for removing the fins is barbaric and cruel, to say the least. Once the shark is caught, the fins are sliced off. The fishermen now dump the often still-alive fish back into the ocean. At this point, the shark is completely immobilized and will slowly sink to the bottom of the sea, bleeding and drowning. Of course, it becomes an easy target for other predators too. Marketing And Sale Of The Harvested Fins. What drives the shark fin market is the amount of money these fishermen can make on the international market. Shark fins are the most expensive sea food product for now and the larger the fins the better. For instance, ‘trophy’ fins (whale shark pectoral fins), can sell for as much as $20,000 each. Coupled with the increased economic prosperity in many Far Eastern countries, there is still immense demand for shark fin soup. Shark fins have become one of the world’s most precious products and the fishermen are willing to supply. Another angle to consider is that shark meat in itself isn’t very valuable, so that’s why the rest of the shark is thrown overboard. Some other shark parts that are of some value include the skin (for shagreen leather), the liver oil, cartilage, blood, etc. These other parts are mostly used in making medicines and supplements. Shark fin is sold frozen or dried, with the dried type sold whole or in shredded strips. The fins are usually treated with hydrogen peroxide to improve the color and make it more appealing to consumers. Strangely enough, the fin itself has little or no flavor. It is made of cartilage and adds a crunchy, and gelatinous bulk to the soup. The main flavor comes from chicken and ham. The fin is usually sliced into long thin noodle-like strips. There are many beliefs about the “many benefits” of consuming shark fin soup. For instance, in traditional Chinese medicine, it is believed that this soup can enhance human blood circulation and improve the essential life force of the consumer. Lovers of the soup also claim that it improves your kidneys, lungs and bones. However, the reality is that there is no proof to substantiate these claims. In fact, shark meat is not recommended for human consumption due to its extremely high level of mercury compared to other fish. Young children and pregnant women are strongly advised to avoid it completely. The Global Impact Of Shark Fin Soup On Shark Populations. – Despite conservation efforts up to 125 countries still trade in the international shark products market. – Compared to bony fish, sharks are particularly vulnerable to over fishing because of their slow growth, late sexual maturity, and low rates of reproduction. Most species will produce just a few pups a year not thousands or millions of offspring like other fish. – The IUCN has stated that about one third of all the open-ocean shark species are threatened with extinction. – Actual annual shark catch numbers are still a mystery since most of the trade occurs on the black market. – Sharks are ancient animals, they have been on earth for over 400 million years. At the rate we are killing them (circa 100million sharks per year), it appears humans are in a race to eliminate sharks completely. – Marine surveys show that scalloped hammerhead shark populations have dropped by over 97 percent, Bull sharks over 99 percent, and tiger sharks have declined more than 97 percent and that’s just a few of the actual species affected. The Global Impact Of Shark Fin Soup On Marine Ecosystems. Marine ecosystems exist on a delicate and complex food chain that is easily distorted. Take out the top predators (sharks), and you have a ripple effect that can take decades to stabilize. As a result, researchers are already seeing the effect the decimated shark population is having on the oceans. For instance, as sharks decline, shark prey e.g. rays are increasing in numbers, and they are eating more of their own prey, scallops. This effect is occurring globally everywhere sharks used to thrive. Conservation And Enlightenment In Recent Years May Save The Remaining Sharks. The literal meaning of the soup’s Chinese name is “fish wing”. So, it’s only recently that much of the Chinese general populace became aware that shark fin is the main ingredient. Or, that the fins are brutally harvested and the sharks left to die slowly. The efforts of many groups and authorities over the years means that there is improved awareness now about the negative effects of continuous shark finning. At the forefront of this fight are organizations like the IUCN, Fins Attached, the Sea Shepherd Conservation Society, and so on. As a result, awareness is growing and that’s a good trend. Many third generation citizens of countries that are known for consuming shark fin soup now pledge not to consume any more shark fin soup, even at their weddings. There are reports that the demand for shark fins has reduced globally over the last five years, but the figures are not yet definite. The National Oceanic and Atmospheric Administration (NOAA) is another body that is also involved in the conservation efforts for sharks and other marine life. Many countries have also come out to ban the sale and consumption of shark fins, though, loopholes in many conservation laws means the black market still thrives. Chefs are now coming up with alternatives to shark fin soup that produce the same texture. 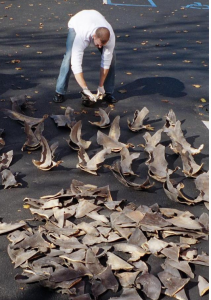 These alternatives called “mock shark’s fin” started in Hong Kong in the 1970s. 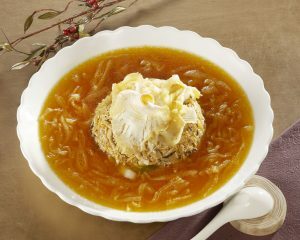 Mock shark fin soup is made using a variety of products like chicken, pig skin, vermicelli, etc. In conclusion, remember that shark fin is not good for you health wise. Also, you wouldn’t chop off the legs of a cow and leave it to die slowly just because you want to eat cow legs, would you? So why do that to a shark, or any animal at all?